This is one of the biggest advantage i.e. leveraging your years of experience on Spring MVC to expose your application as REST APIs. Another reason is that Spring has excellent support for developing RESTful web services. In last a couple of versions, starting from Spring version 3.0, it has provided a lot of enhancements to Spring MVC to provide first-class REST support. It has provided dedicated annotations e.g. @RestController and @ResponseStatus to make the development of RESTful resources even easier in Spring 4.0. It's also not only help you to create RESTful web services but also provides classes to consume REST resources e.g. you can use RestTemplate class to consume RESTful resources. There are many more utility classes and annotations which makes the development of RESTful web services in Spring easier and seamless and I'll share a couple of them in this article to prove my point that using Spring to develop RESTful Web service is the right decision. How Spring Supports RESTful Web Services? As I told you in the first paragraph that we can use Spring MVC to create and consume RESTful web services. Now, let's see those supports in a little bit more details so that you can make the best use of them and quickly develop the RESTful services you always wanted to. 1. In Spring MVC, a controller can handle requests for all HTTP methods, which is a backbone of RESTful web services. For example, you can handle GET method to perform read operation, POST method to create resources, PUT method to update resources, and DELETE method to remove resources from the server. From Spring 3.2 onwards, you can also handle PATCH requests. Btw, if you are not familiar with Spring MVC framework then Spring MVC For Beginners on Udemy is a good place to start. 2. In case of REST, the representation of data is very important and that's why Spring MVC allows you to bypass View-based rendering altogether by using the @ResponseBody annotation and various HttpMessgeConverter implementations. By using this two you can directly send a response to client e.g. the resource clients wants and also in the format they want. I'll write more about @ResponseBody annotations and HttpMessageConverter in this blog in coming articles, but if you can't wait, I suggest you go through REST with Spring Certification class by Eugen. He not only explains the basic details of developing RESTful web services but also advanced details like versioning and securing your REST APIs using Spring Security. 3. The Spring 4.0 release added a dedicated annotation @RestController to make the development of RESTful web services even easier. If you annotate your controller class using @RestController instead of @Controller then Spring applied message conversations to all handler methods in the controller. This means you don't need to annotate each method with the @ResponseBody annotation. This also makes your code much cleaner. You can read more about it on my post difference between @Conroller and @RestController in Spring. 4. 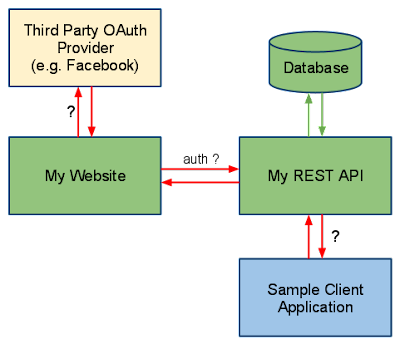 One of the main difference between REST web services and a normal web application is that REST pass resource identifier data in URI itself e.g. /messages/101 while web application normally uses a query parameter e.g. /messages?Id=101. If you remember, we use @RequestParam to get the value of those query parameter but not to worry, Spring MVC also provides a @PathVariable annotation which can extract data from URL. It allows the controller to handle requests for parameterized URLs. You can learn more about @PathVariable in my post difference between @RequestParam and @PathVaraible in Spring. 5. Another key aspect of RESTful web services is Representation e.g. the same resource can be represented in different formats e.g. JSON, XML, HTML etc. Thankfully Spring provides several view implementations and views resolvers to render data as JSON, XML, and HTML. For example, ContentNegotiatingViewResolver can look at the file extension of requests or Accept header to find out the correct representation of a resource for the client. 6. Similar to @ResponseBody annotation, which is used for converting the response to the format client wants (by using HttpMessageConverts), Spring MVC also provides @RequestBody annotation, which uses HTtpMethodConverter implementations to convert inbound HTTP data into Java objects passed into a controller's handler method. You can further see REST with Spring MasterClass to learn more about @RequestBody annotation and how to effectively use it to develop RESTful web services in Java with Spring. 7. Spring Framework also provides a Template class, RestTemplate, similar to JdbcTemplate, and JmsTemplate, which can consume REST resources. You can use this class to test your RESTful web service or develop REST clients. I have already talked about this class in my earlier blog posts and you can see this tutorial for a live example of using RestTemplate to consume JSON from a RESTful web service in Java. These were some of the important features of Spring MVC framework which assist in developing RESTful web services. As I told the most important reason for me to choose Spring for developing RESTful resources is that I can use my existing knowledge of framework, which means no steep learning curve. If you look at from high level, developing RESTful services is not very different from developing a web application. If you are still not convinced, I suggest you go through REST with Spring Certification class on Baeldung, probably the best resource on Spring with REST at the moment, which will give you enough reason to stick with Spring for developing both RESTful resources and REST clients. How to build Microservices with Spring Cloud? Difference between Restlet, Jersey, and RESTEasy in Java? What is the use of DispatcherServlet in Spring MVC? How to enable Spring security in a Java web application? Thanks for reading this article, if you like these reasons for developing RESTful web services using Spring then please share with your friends and colleagues. If you have any questions or feedback, then please drop a note.